Objectives: Various types of minimally invasive techniques have been developed for the treatment of lumbar disc herniation. The original laminectomy was refined into microdiscectomy (MD). MD is the gold standard in management of lumbar disc herniation and is used as a yardstick for comparison with newer procedures such as tubular discectomy. So far, no studies have been reported in Indian population comparing tubular discectomy and microdiscectomy. 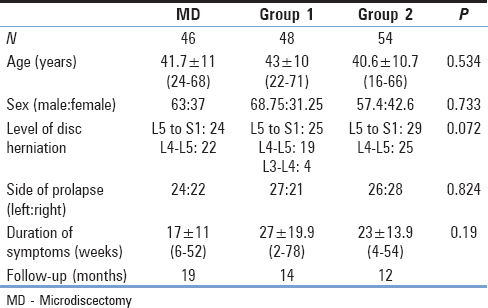 The aim of this study was to compare immediate postoperative and 1-year outcome of patients undergoing tubular discectomy with those undergoing MD and to evaluate the learning curve as well as complication rates of tubular discectomy. Materials and Methods: Forty-six patients of MD and 102 (48 early and 54 late) patients of tubular discectomy (TD) were operated at Indian Spinal Injuries Centre, which is a tertiary level center between July 2009 and January 2012. They were studied for the following data: Baseline characteristics, visual analog scale (VAS) for leg pain and back pain, Oswestry Disability Index (ODI) scores, length of hospital stay, time taken to return to work, duration of surgery, intra- and post-operative complications, and reoperation rates. Results: The VAS score for leg pain, back pain, and ODI scores showed improvement in both groups during the 1st year after surgery. Time taken to return to work and mean hospital stay was shorter in case of TD as compared to MD group. The mean duration of surgery was 34 min shorter for conventional MD. The incidence of dural tear was 6.5% in MD group and 10.4% in early TD and decreased to 7.4% in late TD group. Conclusion: This study revealed that rate of recovery is significantly faster for TD as compared to conventional MD. In contrast, we encountered fewer complications in MD approach as compared to TD which although were not statistically significant and which also decreased as we gained experience. Keywords: Complications; learning curve; microdiscectomy; outcomes; tubular discectomy. Newer techniques were developed with the objective of achieving less tissue trauma in a fast and efficient way. With the introduction of the microscope, the original laminectomy was refined into microdiscectomy (MD). The analysis of various retrospective clinical studies revealed good clinical success rates of MD. Microsurgical discectomy could be used in all types of disc herniations. It did not prolong the operation time, and the overall rate of complications was not increased. MD gained progressive popularity, as it achieved an equivalent success rate to open discectomy. In the recent times, the evolving enthusiasm surrounding minimally invasive techniques in spinal surgery resulted in the evolution of various percutaneous procedures., Subsequently, other minimally invasive techniques involved. In 1997, Foley and Smith  introduced the minimally invasive technique of transmuscular tubular discectomy (TD) which is a procedure that combines spinal endoscopy and the techniques used in MD. The aim of this study was to compare the outcomes including clinical effectiveness, complication rate, and return to work in patients undergoing TD with those undergoing conventional MD. We also aim to evaluate, analyze, and quantify the learning curve, complication rates and clinical results of endoscopic spine surgery. A retrospective review of records of patients admitted and operated at Indian Spinal Injuries Centre which is a tertiary level center between July 2009 and June 2012 revealed 148 cases which could be included in the study. Of these, 46 were MD cases and 102 TD cases. To evaluate the learning curve, TD cases were further divided into two groups: Group 1 - those undergoing TD between July 2009 and December 2010 (n = 48) initial TD cases, Group 2 - those undergoing TD between January 2011 and June 2012 (n = 54) subsequent TD cases. MD and TD were performed by two different surgeons who had several years' experience with the open discectomy technique before the study. 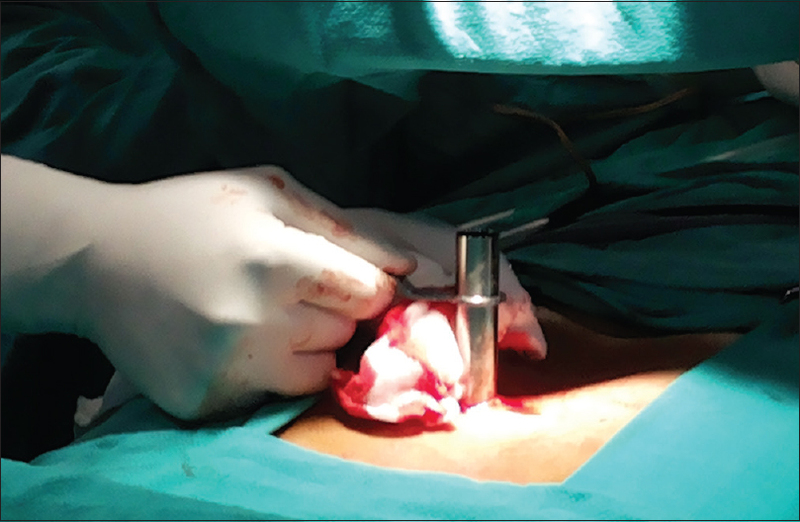 In brief, patients in the MD group underwent a standard midline incision of 3–4 cm in length and a muscle-stripping approach on the side of the disc herniation., A Medtronics quadrant retractor was then inserted and spread over the interlaminar space. The herniated disc was removed by the aid of microscope magnification [Figure 1]. In contrast, the patients in the TD group underwent a paramedian incision 1.8 cm in length with a transmuscular approach to the interspace using serial soft-tissue dilators. A tubular retractor was then inserted to maintain surgical access [Figure 2].,, In both procedures, only the herniated portion of the disc was removed. Patients were mobilized the next day and asked to resume their daily routine activities gradually over the next 2–3 weeks. Data were recorded from case records. Follow-up data were obtained during follow-up outpatient department visits, physiotherapy records, and telephonic interviews. The variables that were analyzed included the level and side of the procedure, length of stay, estimated blood loss, and operating time. The variables that were recorded for complications included cerebrospinal fluid (CSF) leak, residual disc requiring reoperations, infection, and neurological injury. Residual or retained disc was defined as clinically symptomatic prolapsed disc fragment immediately following lumbar discectomy. Clinical outcomes were evaluated by visual analog scale (VAS) scores for leg and back pain, Oswestry disability index (ODI) scores and modified Macnab criteria. Back and leg VAS and ODI scores before surgery (preoperative), at the first follow-up after 7 days from surgery (postoperative), and subsequently at recent follow-up were noted and tabulated in Excel sheet. Statistical calculations were performed using the Student's t-test for continuous variables and Fisher's exact test for noncontinuous variables. The P values were calculated for statistical significance, and a threshold of P < 0.05 was used to determine statistical significance. [Table 1] depicts the demographic data of the three groups. Mean age in MD group was 41.7 years while it was 43 in Group 1 and 40.6 in Group 2, respectively. Males constituted 63.04%, 68.75%, and 57.4% in MD, Groups 1 and 2, respectively. There was no statistical difference in age (Student's t-test) and gender (Chi-square test) between the three groups. The mean follow-up for MD group was 19 months, for Group 1 was 14 months and for Group 2 was 12 months, respectively. Prolapsed intervertebral disc at L5-S1 was the predominant level and was present in 52.17% in MD, 52.08% in Group 1, and 53.7% in Group 2, respectively. Disc fragment prolapse was on the left side in 52.17% of MD group, 54.17% of Group 1 and 48.14% of Group 2 patients. There was no significant difference in level and side of disc prolapse between the three groups according to the Chi-square test. Duration of pain averaged 17, 27, and 23 weeks in MD, Group 1, and 2, respectively. [Table 2] depicts improvement in VAS and ODI scores in all the three groups. There was a significant improvement in leg pain as measured by VAS and ODI scores between pre- and post-operative levels in 1st week in the three groups (P ≤ 0.001), but there was no difference in values in between the groups. 82.6%, 54.16%, and 66.66% of patients suffered from back pain in MD, Groups 1 and 2, respectively. There was significant improvement in VAS scores for back pain in all the three groups at 1 week (P ≤ 0.001). The improvement in TD group was more than the MD group at 1 week postoperative but it was not statistically significant (P = 0.614). ODI scores shared a similar trend in all the three groups at 1 week postoperatively. Modified macnab criteria at first postoperative week also revealed excellent results in 63%, 72.9%, and 79.6% in MD, Group 1 and 2, respectively. There was no significant difference while comparing the values between the groups (P = 0.683). Average surgical time was significantly shorter in MD group (91 min) as compared to early TD cases (125 min) but decreased over time, i.e. 108 min in late TD group (P ≤ 0.001). Average blood loss was significantly higher (148 ml) in MD group as compared to 57 ml in Group 1 and 41 ml in Group 2 respectively (P ≤ 0.001). Length of incision as measured from the surgical scar was 1.8 cm in TD while it was 3.5 cm in MD group. In last 10 of our patients, we calculated prospectively number of C-RAM shoots which came to be significantly lower in MD group (3.39) as compared to TD group (12.48) (P ≤ 0.001). Average hospital stay in late TD (1.74 days) which was significantly less than MD group (2.81 days) (P ≤ 0.001). Early TD group stayed in the hospital for 2.76 days. Likewise, MD patients took 6.96 weeks to return to activity which was higher than early TD patients (6 weeks) (P = 0.156) and which significantly decreased to 3.95 weeks in late TD group (P ≤ 0.001) [Table 3]. Main peroperative complication was dural tear. There were 3 cases (6.5%) of dural tear in MD group and five cases (10.4%) in Group 1 which decreased to 4 cases (7.4%) in Group 2. The difference was not significant as given in [Table 4]. Postoperative complications encountered were mainly residual disc and wound infection. Residual disc requiring reoperation was seen mainly in Group 1 (4 [8.3%]) which decreased to 1 patient (1.85%) in Group 2. There were 2 cases (4.3%) of residual disc in MD group (P = 0.46). Wound infection was observed in 1 case each in MD and Group 1. There was one case of nerve root injury which led to postoperative extensor hallicus longus (EHL) weakness in Group 2, which recovered completely in 2 months. There was no case of wound hematoma or urinary tract infection in any of the groups [Table 4]. Although randomized controlled trials are considered as the strongest evidence, they also have some shortcomings. First, they often involve only a limited section of the typical patient population suffering from the condition and hence have questionable external validity., Second, many a times patients are operated only to complete the trial quickly, and all prerequisites are not met. Many a times factors concerned with experience and practice also influence the overall outcomes. We observed significant difference in operative time, blood loss and number of IITV shoots between each group utilizing bonferroni multiple comparison test. Other studies share the same result.,,, There was significant difference between early and late tubular groups, signifying the learning curve. The study proved equal efficacy of both procedures in reducing leg pain as highlighted by other studies.,,,, However, there was greater reduction in back pain in TD group. The reason could be less tissue trauma due to dilation and thus preservation of the paraspinous muscles. Electromyography study done by Schick is a proof of the phenomenon. Brock  reported less consumption of analgesic in patients operated by transmuscular technique. However, some other studies differ on this fact. Arts  and Anderson  described increased back pain in TD as compared to MD group. Teli et al. did not find any difference in postoperative back pain between micro, microendoscopic, and open discectomy. Return to work was faster in TD group, and the value became significant as our experience in the technique increased. Hospital stay in TD group was also less as compared to MD and value was significant between late TD and MD cases. It was the other way round in the study by Teli et al. (2.3 days in TD vs. 2.1 days in MD), and was equal in the study by Mark. In various reports, the length of postoperative stay ranged from 24 h to up to 3.7 days. Prolonged hospital stay in MD group can be attributed to (1) delayed postoperative recovery due to increased back pain (2) increased blood loss requiring negative suction drain due to which patient had to be kept in hospital for 2–3 days. The same explanation can be given for delayed return to work in MD patients. As we had higher incidence of dural tears and residual disc in early cases of TD, there was a longer hospital stay in these patients. Furthermore, in our earlier cases, we might not have been confident of allowing the patients to return to their activities early. Peroperative complication, the majority of which constituted dural tears (7.4% in TD vs. 6.5% in MD), and postoperative complications, mainly residual disc were more in TD (8.3%) but decreased as we gained experience (1.85% in TD vs. 4.3% in MD). Various studies have reported the occurrence of dural tear in 4–20% in TD , while the incidence in MD is less as compared to TD cases. We also encountered higher number of residual disc requiring revision surgeries and dural tears in our earlier cases, but as the experience of tubular endoscopic discectomy went through, the percentage started decreasing., The management of dural tears, on the other hand, is simple in TD cases as they did not require any closure or application of fibrin glue. We kept such patients on bed for 3 days. None of our patients complained of a headache or postoperative meningocele. Soon after the tubular retractor is removed (within 5–10 min), the tissues fall back, and the small gap is closed so well that there is no space for CSF to accumulate. It is now clear from the discussion that TD is better than MD, but it should be kept in mind that TD techniques involve overcoming a steep learning curve., In this study, we have tried to analyze our learning curve by comparing our first 48 cases with the late 54 cases. Mcloughin et al. and Wang et al. came to the conclusion that 15 cases are required to achieve the learning curve in endoscopic discectomy. However, Mcloughin in his study had only evaluated operating time and Wang observed the operating time and complications. In our study, we have compared operating time, blood loss, hospital stay, return to work, peroperative, and postoperative complications between early and late groups of TD. There was significant reduction in operative time (<0.001), blood loss (<0.001), and return to work (0.001). The reduction in hospital stay (0.013) and complication rate (0.731) was not significant. The incidence of residual disc decreased with experience (0.13). In our initial cases, we had four cases of residual disc, out of which two were managed by open discectomy, one treated conservatively, and one was treated by redo endoscopic discectomy. In our late cases, i.e. Group 2, we had only one case of residual disc prolapse which was treated conservatively. The field of view through the endoscope is limited which makes it difficult to expose and decompress the nerve root.,, As we gained experience, even residual discs, initially operated by open or endoscopic discectomy were managed through tubular access. Some of the limitations of our study are: (1) MD and TD were performed by two different surgeons, thus introducing a bias in the study, (2) it was a retrospective study, and (3) number of cases in two groups are different. Some key points for safe and successful completion of microendoscopic discectomy are: (1) Correct placement of the k-wire at facet lamina junction, (2) introduction of the blunt end of the k-wire, (3) never descend the wire below the level of the lamina, (4) placement of the tubular retractor under continuous lateral fluoroscopy, (5) reassessment of the position of the retractor on anteroposterior fluoroscopy, (6) careful identification of anatomical structures so that facet capsule is not violated hence preventing iatrogenic instability, and (7) use of burr to remove the part of lamina and facet so as to reach to the culprit disc (8) safe detachment of the flavum from the underlying dura through a ball tipped probe (9) maintenance of effective hemostasis with the help of bipolar cautery. The technique of TD for symptomatic lumbar radiculopathy is a safe and an effective procedure and is better than MD in terms of reduced postoperative back pain, blood loss, shortened hospital stay, and faster return to work. There is, however, a significant experience-related learning curve in terms of complication rate and operative time. To avoid these complications, it is recommended to have extensive experience in conventional open procedure before attempting this technique. Meticulous attention must be paid toward accurate anatomic positioning, careful dissection, and manipulation of the nerve root and disc material, and hemostasis. Despite the learning curve, TD has been shown to be an effective option in the treatment of lumbar disc herniation in the appropriately selected patient. Konstantinou K, Dunn KM. Sciatica: Review of epidemiological studies and prevalence estimates. Spine (Phila Pa 1976) 2008;33:2464-72. Gibson JN, Waddell G. Surgical interventions for lumbar disc prolapse: Updated cochrane review. Spine (Phila Pa 1976) 2007;32:1735-47. Hofstee DJ, Gijtenbeek JM, Hoogland PH, van Houwelingen HC, Kloet A, Lötters F, et al. Westeinde sciatica trial: Randomized controlled study of bed rest and physiotherapy for acute sciatica. J Neurosurg 2002;96 1 Suppl: 45-9. Vroomen PC, de Krom MC, Slofstra PD, Knottnerus JA. Conservative treatment of sciatica: A systematic review. J Spinal Disord 2000;13:463-9. Atlas SJ, Keller RB, Wu YA, Deyo RA, Singer DE. Long-term outcomes of surgical and nonsurgical management of sciatica secondary to a lumbar disc herniation: 10 year results from the maine lumbar spine study. Spine (Phila Pa 1976) 2005;30:927-35. Henriksen L, Schmidt K, Eskesen V, Jantzen E. A controlled study of microsurgical versus standard lumbar discectomy. Br J Neurosurg 1996;10:289-93. Peul WC, van Houwelingen HC, van den Hout WB, Brand R, Eekhof JA, Tans JT, et al. Surgery versus prolonged conservative treatment for sciatica. N Engl J Med 2007;356:2245-56. Arts MP, Peul WC, Koes BW, Thomeer RT; Leiden-the Hague Spine Intervention Prognostic Study (SIPS) Group. Management of sciatica due to lumbar disc herniation in the Netherlands: A survey among spine surgeons. J Neurosurg Spine 2008;9:32-9. Yasargil MG. Microsurgical operation for herniated disc. Adv Neurosurg 1977;4:81. Caspar W. A new surgical procedure for lumbar disk herniation causing less tissue damage through a microsurgical approach. Adv Neurosurg 1977;4:74-7. Brayda-Bruno M, Cinnella P. Posterior endoscopic discectomy (and other procedures). Eur Spine J 2000;9 Suppl 1:S24-9. German JW, Adamo MA, Hoppenot RG, Blossom JH, Nagle HA. Perioperative results following lumbar discectomy: Comparison of minimally invasive discectomy and standard microdiscectomy. Neurosurg Focus 2008;25:E20. Harrington JF, French P. Open versus minimally invasive lumbar microdiscectomy: Comparison of operative times, length of hospital stay, narcotic use and complications. Minim Invasive Neurosurg 2008;51:30-5. Lee DY, Lee SH. Learning curve for percutaneous endoscopic lumbar discectomy. Neurol Med Chir (Tokyo) 2008;48:383-8. Nakagawa H, Kamimura M, Uchiyama S, Takahara K, Itsubo T, Miyasaka T. Microendoscopic discectomy (MED) for lumbar disc prolapse. J Clin Neurosci 2003;10:231-5. Perez-Cruet MJ, Foley KT, Isaacs RE, Rice-Wyllie L, Wellington R, Smith MM, et al. Microendoscopic lumbar discectomy: Technical note. Neurosurgery 2002;51 5 Suppl: S129-36. Chin KR, Michener TA. Prospective evaluation of a 3-blade speculum cannula for minimally invasive lumbar microdiscectomy. J Spinal Disord Tech 2006;19:257-61. Dewing CB, Provencher MT, Riffenburgh RH, Kerr S, Manos RE. The outcomes of lumbar microdiscectomy in a young, active population: Correlation by herniation type and level. Spine (Phila Pa 1976) 2008;33:33-8. Riesenburger RI, David CA. Lumbar microdiscectomy and microendoscopic discectomy. Minim invasive Ther Allied Technol 2006;15:267-70. Mostafa HA, Abd El Rahiem HA, Salem TL, Darwish AM, Fakhr A. Comparative randomized clinical study between open conventional lumbar discectomy and micro endoscopic lumbar discectomy. J Egypt Soc Neurol Surg 2007;22. Porchet F, Bartanusz V, Kleinstueck FS, Lattig F, Jeszenszky D, Grob D, et al. Microdiscectomy compared with standard discectomy: An old problem revisited with new outcome measures within the framework of a spine surgical registry. Eur Spine J 2009;18 Suppl 3:360-6. Lau D, Han SJ, Lee JG, Lu DC, Chou D. Minimally invasive compared to open microdiscectomy for lumbar disc herniation. J Clin Neurosci 2011;18:81-4. Schick U, Döhnert J, Richter A, König A, Vitzthum HE. Microendoscopic lumbar discectomy versus open surgery: An intraoperative EMG study. Eur Spine J 2002;11:20-6. Teli M, Lovi A, Brayda-Bruno M, Zagra A, Corriero A, Giudici F, et al. 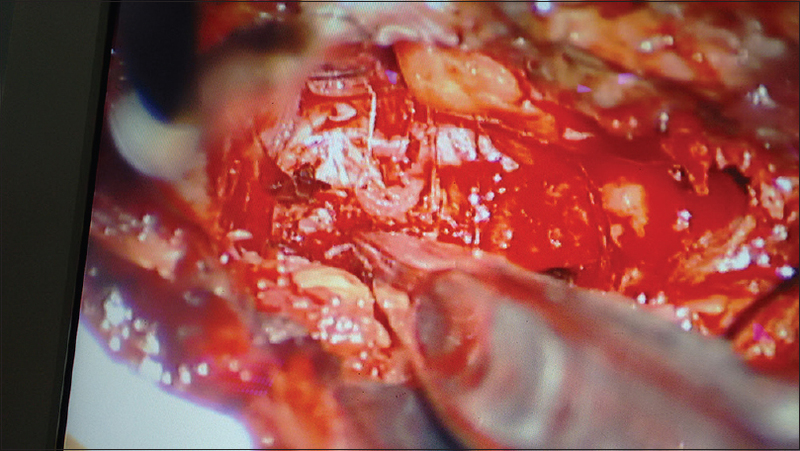 Higher risk of dural tears and recurrent herniation with lumbar micro-endoscopic discectomy. Eur Spine J 2010;19:443-50. Arts MP, Brand R, van den Akker ME, Koes BW, Bartels RH, Peul WC, et al. Tubular diskectomy vs conventional microdiskectomy for sciatica: A randomized controlled trial. JAMA 2009;302:149-58. Landewé R, van der Heijde D. Primer: Challenges in randomized and observational studies. Nat Clin Pract Rheumatol 2007;3:661-6. Black N. Why we need observational studies to evaluate the effectiveness of health care. BMJ 1996;312:1215-8. Franke J, Greiner-Perth R, Boehm H, Mahlfeld K, Grasshoff H, Allam Y, et al. Comparison of a minimally invasive procedure versus standard microscopic discotomy: A prospective randomised controlled clinical trial. Eur Spine J 2009;18:992-1000. Arts MP, Nieborg A, Brand R, Peul WC. Serum creatine phosphokinase as an indicator of muscle injury after various spinal and nonspinal surgical procedures. J Neurosurg Spine 2007;7:282-6. Anderson PA. Tubular discectomy resulted in greater leg and back pain and a lower rate of recovery than conventional microdiscectomy for sciatica. J Bone Joint Surg Am 2010;92:475. Fourney DR, Dettori JR, Norvell DC, Dekutoski MB. Does minimal access tubular assisted spine surgery increase or decrease complications in spinal decompression or fusion? Spine (Phila Pa 1976) 2010;35 9 Suppl: S57-65. Matsumoto M, Hasegawa T, Ito M, Aizawa T, Konno S, Yamagata M, et al. Incidence of complications associated with spinal endoscopic surgery: Nationwide survey in 2007 by the Committee on Spinal Endoscopic Surgical Skill Qualification of Japanese Orthopaedic Association. J Orthop Sci 2010;15:92-6. Perez-Cruet MJ, Fessler RG, Perin NI. Review: Complications of minimally invasive spinal surgery. Neurosurgery 2002;51 5 Suppl: S26-36. Wang B, Lü G, Patel AA, Ren P, Cheng I. An evaluation of the learning curve for a complex surgical technique: The full endoscopic interlaminar approach for lumbar disc herniations. Spine J 2011;11:122-30. Mcloughlin GS, Fourney DR. The learning curve of minimally-invasive lumbar microdiscectomy. Can J Neurol sci 2008;35:75-8. Complications; learning curve; microdiscectomy; outcomes; tubular discectomy.